Nyurapayia Nampitjinpa aka Mrs. Bennett (1935-2013) is one of the most important Australian contemporary artists. Mrs. Bennett emanated the dynamic ground-breaking own unique style of painting in the contrast to other Kintore artists. 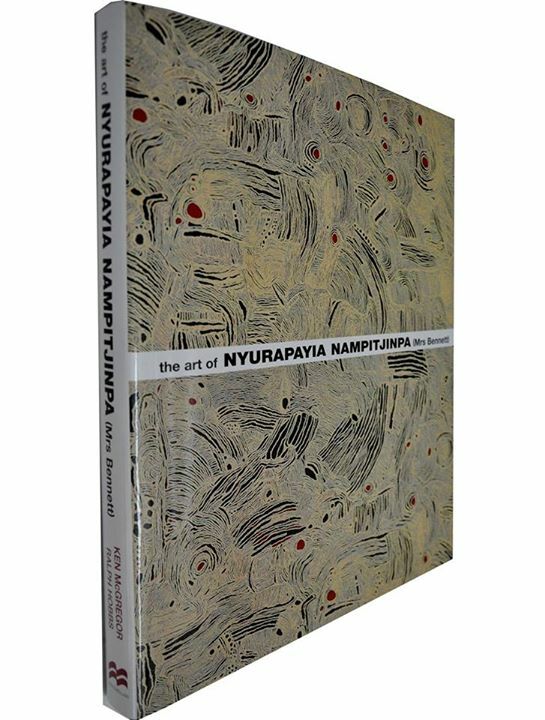 Nyurapayia Nampitjinpa work is keenly sought-after by international buyers. In 2015 Mrs. Bennett Kapi Tjukurrpa 2006 (84cmx84cm) sold for $41,480 Literature: Ken McGregor, Ralph Hobbs, The Art of Nyurapayia Nampitjinpa (Mrs Bennett), Macmillan Art Publishing, 2014, p. 84 (illus.). Nyurapayia Nampitjinpa work is in collections around the world including National Gallery of Australia, National Gallery of Australia, Kelton Foundation Santa Monica, Art Bank , Art Gallery of New South Wales , Museum and Art Gallery Northern Territory, National Gallery of Victoria, National Museum of Australia , Art Gallery of South Australia , National Art Gallery of Queensland , Homes a Court , Art Gallery of Western Australia, Donald Kahn Collection USA and more. Nyurapayia Nampitjinpa aka Mrs. Bennett (1935-2013) work is represented around the world including Kelton Foundation Santa Monica USA, Art Bank Sydney , Art Gallery of New South Wales , Museum and Art Gallery of the Northern Territory, National Gallery of Victoria, National Museum of Australia , Art Gallery of South Australia , National Art Gallery of Queensland , Homes a Court collection , Art Gallery of Western Australia, Donald Kahn Collection US A. 2011 Mrs. Bennett was named the top 50 Australia's most Collectable Artists . Nyurapayia Nampitjinpa Mrs. Bennett is one of the most important Australian artists. Nyurapayia Nampitjinpa, otherwise known as Mrs. Bennett, helped shape the Aboriginal women's painting movement. IN the early hours of Monday morning, 28 January, in the far reaches of her ancestral country, Nyurapayia Nampitjinpa, the most forceful and overwhelming of the first western desert artists, reached the end of her remarkable life . Nyurapayia Nampitjinpa aka Mrs. Bennett (Monday 28th January 2013). Nyurapayia Nampitjinpa was born at Yumarra. 2014 Literature: Ken McGregor, Ralph Hobbs, The Art of Nyurapayia Nampitjinpa (Mrs Bennett), Macmillan Art Publishing, 2014, p. 84 (illus.). The Art Gallery of NSW, Art Gallery of the Northern Territory, National Gallery of Victoria, Artbank and in corporate and private collections internationally. Mrs Bennett loved the strong contrasts using blacks and pale yellows/creams set in relief often against a red ground. 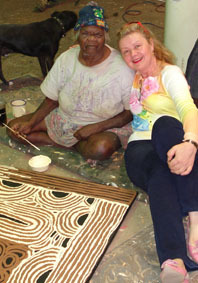 Her designs were based on the stories relating to women's ceremony and regularly depicted the gathering of traditional bush foods and the rituals connected with their preparation. The depictions of the sand dune country and surrounding rocky outcrops bear a relationship to the designs used for body painting during the ceremonial dance referred to as 'inma'. Nyurapayia Nampitjinpa (aka Mrs Bennett) wass married to the late John John Tjapangati Bennett, a Pintupi speaker from Mukulurru, also north of Docker River. Mrs Bennett, Nyurapayia Nampitjinpa born around1935 is an important Australian artist, she has developed a unique style in contrast to other Kintore artists. Nyurapayia was a major participant in the Kintore-Haasts Bluff collaborative canvas project titled "Minyma Tjukurrpa" in 1994 and the Tandanya National Aboriginal Cultural Institute in 1995. Mrs Bennett was instrumental in the development of the Haasts Bluff/Kintore Women's Painting Camp in 1994, she was the commanding figure among today's western desert women artists, a painter of the utmost force and will. 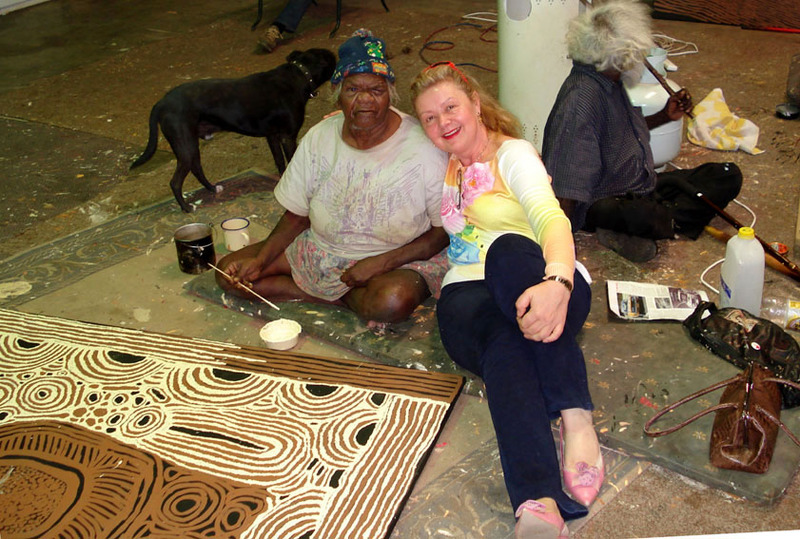 Aboriginal art is the most important contemporary art to come out of this ancient land. Each painting tells a story as well as having an imposing decorative element to the art work. 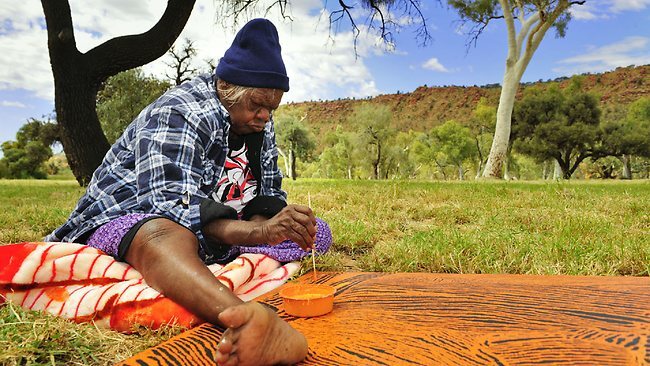 Aboriginal art is part of a living tradition and as the culture goes through a transition, major changes are taking place in the aboriginal communities and people move to the towns learning western ways. The artist’s age thus it is probably the last chance that anyone on this planet can buy such authentic indigenous work of art. Aboriginal paintings are powerful works of art that look superb in modern buildings and they signify, for the people who display them a connection with the present as well as the past. 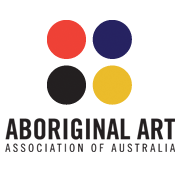 You have an opportunity to purchase the work of the mature, established artists who have had an original traditional aboriginal upbringing. Nyurapayia was a participant in the Kintore-Haasts Bluff collaborative canvas project in 1994. This resulted in an exhibition titled Minyma Tjukurrpa and was held at the Tandanya National Aboriginal Cultural Institute in 1995. Other exhibitions of her works include ‘Twenty-five Years and Beyond’ (1999) and Australia Perspective (1999). 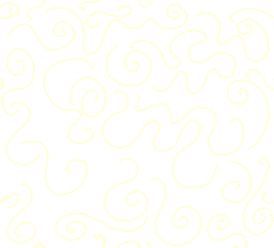 Nyurapayia favors the use of strong contrasts using blacks and pale yellows/creams set in relief against a red ground. 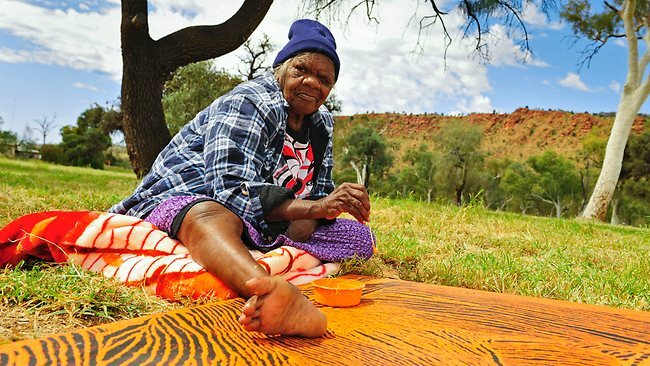 Her designs are based on the stories relating to women’s ceremony and often depict the gathering of traditional bush foods and the rituals that are connected with their preparation. The depictions of the sand dune country and surrounding rocky outcrops bear a relationship to the designs used for body painting during the ceremonial dance referred to as “inma”. The remote Pangkupirri rock holes, a set of clear pools deep in the western desert's Walter James Range, are not well known in metropolitan Australia. But perhaps they should be, and one day will be: their sheer, red walls, the pinnacles and crags that surround them and the rivulets that flow from them are this continent's equivalent of the Saint-Remy gardens or the Mont Sainte-Victoire- a defining artistic landscape, associated with a single master. For Pangkupirri is the constantly depicted subject of "Mrs Bennett", Nyurapaia Nampitjinpa, the commanding figure among today's western desert women artists, a painter of the utmost force and will. The Australian February 15, 2010. 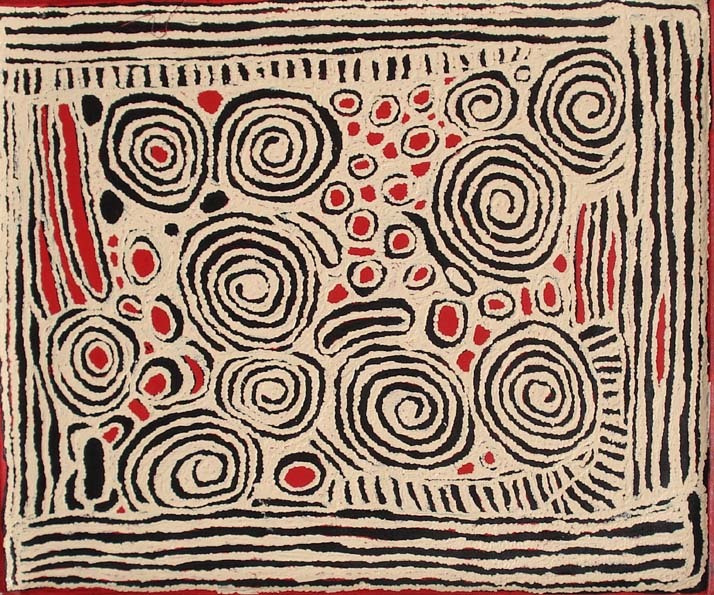 Nyurapayia Nampitjinpa (1935-2013) lived in Kintore however, she has developed a very free and original style in contrast to artists in Kintore who prefer the very precise dot-painting method. Nyurapayia Nampitjinpa born around 1935, has developed a free and very original style in contrast to the artists working in Kintore who prefer the very precise dot-painting method. Mrs. Bennett paintings depicts a series of locations associated with Nyurapayia’s traditional homeland. The concentric circles represent sacred waterholes which are not only a reliable source of water but also significant ceremony sites used for the purpose of initiation. It is here that the senior women associated with the location referred to as “Punkilpirri” prepared for ceremonial rituals. The delineation of carious aspects of the land is represented by a series of parallel and oblique lines. These include the sand country referred to as “tali” and the rocky outcrops known as “puli” Both of these environments. Mrs. Bennett lives in Kintore, her p ainting deceits women camped at the roc-khole site of Yumarra, near Tjukula in Western Australia. The roundels show the camp sites of the women who had travelled from Punkilpirri, a large permanent water site, north-west of Docker River in the Walter James Range. They later continued their travels to the north through Tjukula and Tjalili. While at Yumarra the women performed the ceremonies associated with the area. They also gathered the edible berries and seeds growing in the vicinity. The "U" shapes in this painting show women camped at the rockhole site of Yumarra, south of the large permanent warter site of Punkilpirri, north of Docker River. The women later travelled north to Punkilpirri and Tjukula. As they travelled they gathered the edible berries known as kampurarrpa or desert raisin from the small shrub Solanum centrale . 2007 Papunya Tula Women, Suzanne O'Connell Gallery, Brisbane, Queensland, Australia. 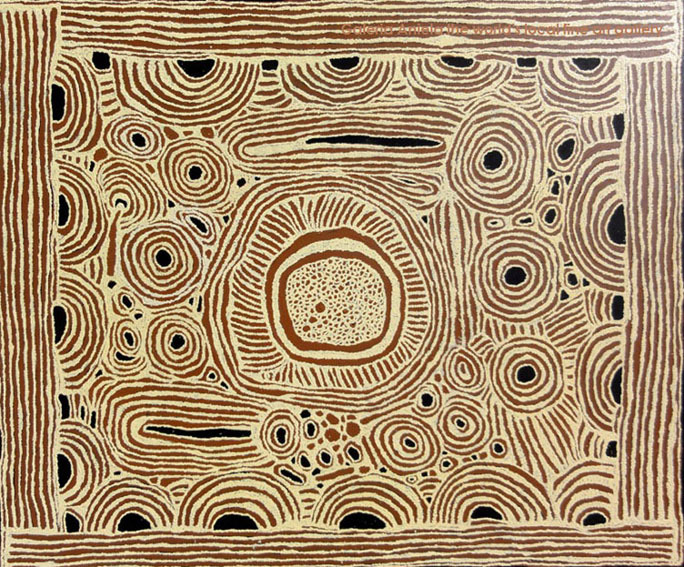 Nyurapayia Nampitjinpa, Kapi Tjukurrpa 2006, Synthetic polymer paint on linen, size: 84x84cm Est: $15,000-20,000, Mossgreen Auctions, Fine Australian & International Art, Melbourne, 23/11/2015, Lot No. 25 (Provenance: Yanda Aboriginal Gallery, Alice Springs. Private Collection, Port Douglas. Private Collection, Ballarat. Literature: Ken McGregor, Ralph Hobbs, The Art of Nyurapayia Nampitjinpa (Mrs Bennett), Macmillan Art Publishing, 2014, p. 84 (illus.). Credits: Galeria Aniela express gratitude to Australian National galleries, Australian and International press, Google and Auction houses, without them our extensive research would not be available (compiling facts that have found relevant and useful including the links to the original source whenever possible). We hope you will enjoy the services. Nyurapayia Nampitjinpa aka Mrs. Bennett is one of the World’s most ground-breaking modern artists, successful in the World Art Market . Literature: Ken McGregor, Ralph Hobbs, The Art of Nyurapayia Nampitjinpa (Mrs Bennett), Macmillan Art Publishing, 2014, (illus. p. 88). Literature: Ken McGregor, Ralph Hobbs, The Art of Nyurapayia Nampitjinpa (Mrs Bennett), Macmillan Art Publishing, 2014, (illus. p.88). Shipping worldwide usually dispatched within 24 hours, delivery in 3-5 business days or Pick Up from Galeria Aniela . Literature: Ken McGregor, Ralph Hobbs, The Art of Nyurapayia Nampitjinpa (Mrs Bennett), Macmillan Art Publishing, 2014, (illus. p. 82 and 90). Literature: Ken McGregor, Ralph Hobbs, The Art of Nyurapayia Nampitjinpa (Mrs Bennett), Macmillan Art Publishing, 2014, (illus. p. 89). An ancient tradition of 60 thousands years gave the world its most exciting form of contemporary art. Aboriginal art is the most important contemporary art to come out of this ancient land. We aim to be a place of experience and inspiration through art , sculpture park and exhibitions. Galeria Aniela offers an opportunity to acquire authentic, ethically sourced museum-quality art of impeccable provenance. This book features hundreds of paintings by the distinguished Alice Springs based artist known as Mrs Bennett. A special feature of the publication is the series of photographs showing Mrs Bennett's methods of production - with the various applications of paint and its distribution over the canvas that lead to her readily recognisable personal style. This is a lavishly illustrated account of Mrs Bennett's life and work and, as such, provides another important monograph dedicated to the achievements of individual Indigenous artists. Five years ago, The Weekend Australian shone a light on the Aboriginal art world, exposing a nest of unscrupulous operators, exploiting and profiteering at the expense of artists. The reports prompted a Senate inquiry from the Howard government. And in June 2007, to general applause, it recommended a code of conduct, greater scrutiny from authorities and increased support for indigenous art centres. The recommendations came down one day before the Howard government's intervention into Northern Territory Aboriginal communities. But these well-intentioned interventions into Aboriginal art have had a mixed effect. In fact, there is increasing evidence they are contributing to the deep malaise afflicting the entire indigenous art market. The effects of the global financial crisis, personal disputes, confusion over superannuation investment rules and a new resale royalty should not be underestimated. But critics say the attempts to regulate the market, particularly the empowerment of arts centres, are shutting private dealers and artists out of the market and contributing to a glut of art that is driving down prices. Mark Walker experienced the faultlines running through the fractious Aboriginal art sector when he made a momentous discovery at the studio of private dealer, Chris Simon. For four years, Mr Walker had sold high-quality art at his Perth gallery, Randell Lane Fine Art, most of it sourced from Aboriginal-owned art centres in central Australia. In late 2009, he visited Mr Simon's Alice Springs Yanda studio and was "blown away" by the new work of Esther Giles, a much-collected western desert painter. He organised to show her work at his Perth gallery the following year. Before long, word reached the art centres. "We really only have one rule regarding the marketing of the work from Tjala Arts and that is that we don't work with galleries that show work from private dealers," one arts centre manager wrote to Mr Walker in an email. "I am not sure how we can continue to work with Randell Lane if you are changing where you source your artwork." Mr Walker held the exhibition as planned, but says other art centres also pulled work as a result. He closed the gallery and last month launched a new venture, Harvison Gallery, dedicated to indigenous and non-indigenous art. He says he will no longer be told what works he can show. "After years of hard work, I lost everything over one exhibition," he said. "It's like schoolyard bullying." It has all become too much for Sydney barrister Clive Evatt. After opening Hogarth Galleries in 1972, and dedicating it to indigenous art in 1990, he shut it down last year, saying the market was "flooded" with paintings and that buyers were disappearing. "It's a tragedy," he says. "The art market has seen its best days. I doubt it will recover." Prices are falling. 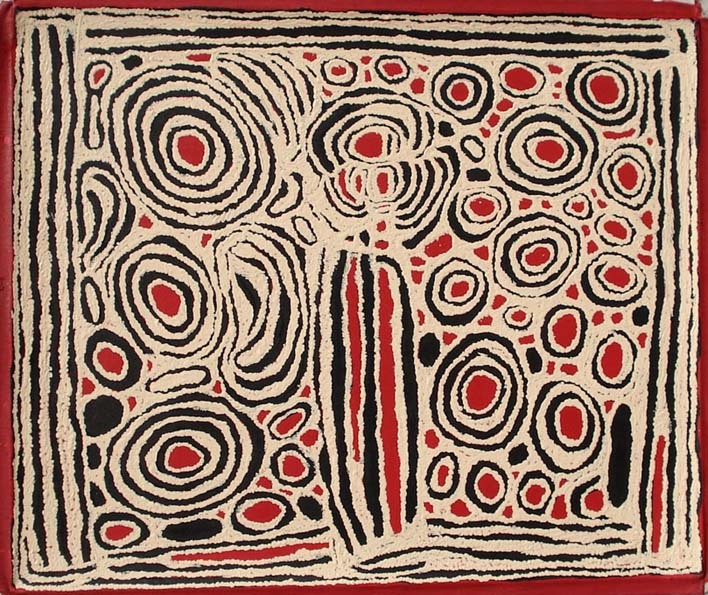 From a peak of $23.9 million in 2007, up from $16.5m the previous year, the value of Aboriginal art sales at auction dropped to $13.4m in 2008, $12.5m in 2009 and $10.1m last year, according to figures compiled by Australian Art Sales Digest. Melbourne gallery owner Beverly Knight believes the market is starting to mature, with collectors regarding the art as contemporary Australian first and Aboriginal second. But she says there is an oversupply of Aboriginal art. While she is a supporter of indigenous art centres - the community-owned organisations that fulfil a cultural and social function beyond the production of art - she claims there are too many artists working at too many art centres, and the market is feeling the strain. "It's totally flooded," she says. Since a Senate inquiry, art centres have been empowered by strong government support. In 2009, then arts minister Peter Garrett said $9.3m would be divided among 86 arts organisations, with triennial funding recipients including Warlukurlangu ($270,000) and Tjungu Palya ($336,600). The Senate report was clear about their importance, and Mr Garrett is known to have urged state institutions to favour work from Aboriginal-owned arts centres. In addition, the number of art centres - from north Queensland to the Kimberley - has grown by about 20 per cent. Some awards, such as the popular Desert Mob in Alice Springs, are restricted to work entered by art centres while others, such as the annual Telstra award in Darwin, have come under pressure to do the same. By contrast, private dealers working outside the system, offering varying levels of support directly to artists, are regarded with suspicion, as are the city galleries that associate with them. For Cecilia Alfonso, manager of the Warlukurlangu art centre in Yuendumu, the division has become an "unwinnable war". "There's a lot of art centre fascists out there, but you have to be realistic, and the art centre model is one model," she says. 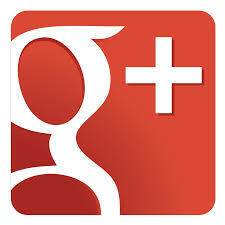 "I work in a very large community and I'm here to provide people with a viable, ethical alternative. But I'm not here to stop them doing whatever they want." Ms Alfonso rejects claims her centre has flooded the market, saying she is supplying the tourist end of the market. "I am actually on the ground providing disadvantaged, remote indigenous people with a legitimate means of making a living and an ethical, fair return on their work," she says. "I'm also here to give people something to do in a place of chronic disadvantage and unemployment." Many centres are sceptical of figures such as Chris Simon, a private Yanda dealer in Alice Springs who works with six to eight artists at a time at his Alice Springs studio, including Esther Giles and Bennett. Mr Simon is aware of the antagonism of some art centres, but says he pays no attention. Mr Simon says he refers clients to art centres when necessary, saying they do a "good job" but are unable to offer the high quality, personalised support that he can. "Blackfellas can think for themselves," he says. "I just run a business, that's all. And if you're running a business, as far as I'm concerned, there's only two groups of people I worry about: the people I'm buying off, the people I'm selling to, and both sides have got to be happy and the rest of the world can go take a long running jump." Almost a year since the indigenous art code of conduct opened for members, many figures continue to resist signing up. Only now has a chief executive, John Oster, been appointed to oversee the code. Mr Oster, who starts in the new role after Easter, has for four years been executive director of Desart, representing central Australian Aboriginal art centres, but says his appointment is "not sectarian". "The code has an enormous role to play here in breaking down traditional industry barriers." Galeria Aniela aim to be a place of experience and inspiration, through art collections , sculpture park, exhibitions , programs , research and sharing knowledge . Nyurapayia Nampitjinpa, otherwise known as Mrs Bennett, helped shape the Aboriginal women's painting movement. IN the early hours of this Monday morning, in the far reaches of her ancestral country, Nyurapayia Nampitjinpa, the most forceful and overwhelming of the first western desert artists, reached the end of her remarkable life. In any culture she would have stood out: she was a woman of will and pride, utterly confident, completely present in herself, yet generous, sentimental, awash with emotions keenly felt. She could neither read nor write, yet she held in her head a universe of song and sacred knowledge. She was at the pinnacle of desert law: in her art, which was nothing but a translated image of that law and culture, she was a fierce expressionist. But it was her circumstances as much as her innate character that made her and shaped her unusual trajectory. No one will live a life like hers again. She was born in Pitjantjatjara country, near the site of today's Docker River community. She spent much of her childhood at Pangkupirri, a set of sheltered rockholes deep in the range-folds of the Gibson Desert. She was raised in an extended nomad familial group. She saw no white men until she was in her teens, although she had heard strange tales of their presence on the fringes of the vast sand-dune terrain she travelled through. She remembered well her first, fleeting contact with the outside world. It came in a cool season: her father and his two brothers led their children on a cautious journey westwards, through the desert oak country, over dry creeks for days on end, until they reached the new mission compound at Warburton. From a safe distance they stared over the fence at the white people working there, then retreated to the bush again. Those were years, for Nyurapayia, of learning the country, of immersion in ceremonial cycles, of deep study of the desert world and its creatures, both visible and invisible. She became a magic healer; she married the tranquil, solemn John John Bennett Tjapangati. By then western influence was spreading through the desert: engagement with that world was becoming inevitable. The pair walked in together from the bush to Haasts Bluff settlement in the Ulumbara Ranges and began a new kind of life. There they encountered the mission strain of Christian belief, which had some resonances with the old religion of their hearts. Even in those times, at rations depots and settlements, Nyurapayia was a figure of great and growing authority. She loved her culture, she performed it, she imprinted it within herself and became it: in this guise she was a key to the dispersed yet tight-linked society of the western desert. In recent years, whenever old women, themselves revered leaders, came face to face with Nyurapayia they would fall to their knees and hug her, and begin to sing the ancient songs she had taught them decades earlier in sacred dialects. In the 1980s, together with Mr Bennett, Nyurapayia moved to Kintore, the new western settlement of the Pintupi, set closer to their traditional lands, and then on to Tjukurla, across the West Australian border. They lived there quietly and raised their daughter, Dorcas, and a son who died in early adulthood. Mr Bennett painted for Papunya Tula Artists, and gained a reputation for careful, introspective work. Nyurapayia, though, was quite a different kind of artist. Front-foot, dynamic, authoritative, she helped shape the women's painting movement that sprang up in the mid-1990s: she was close to the key painters; they influenced each other. Indeed their work was so intertwined it makes compelling sense to see this movement in its early stages as a collective enterprise. Then came sadness: Mr Bennett died, a decade ago. For all her magnificence, Mrs Bennett was alone. Few, though, would have been able to predict the course her life then took. For the art centre staff at Papunya Tula, who had a dozen self-possessed old women to deal with, she was a handful: a queen who knew herself to be one, and expected to be treated as such. They were able to coax only mid-grade, formulaic works from her. Her demanding catch-cry - "Mrs B, No 1"- originated at this time. Eventually she left Kintore and fell in with the roughest of the rough diamonds of the desert art trade, Chris Simon, who took her in and worked her, and fell for her manner and her character: indeed he came to love and admire her, and he rebuilt his Yanda Art business around her. 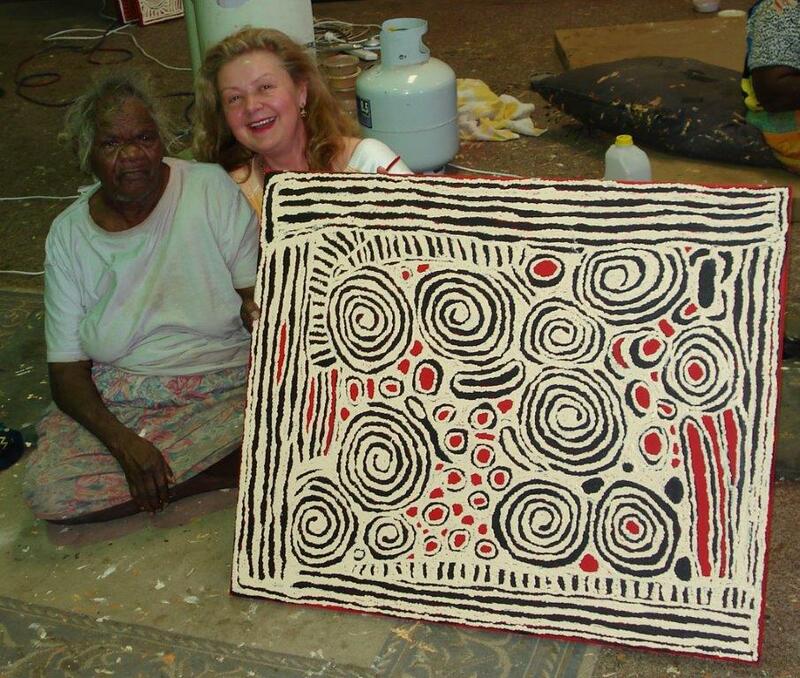 These were the boom years of the Aboriginal art bazaar, Nyurapayia was in her early 70s, living comfortably, well cared for and hitting her creative peak. By day she would pour out large, complex canvases depicting her ancestral rockholes in dark, curved lines on white, shimmering grounds. When rest-time came she would sit and watch films of "Inma"- old ceremonial dances from the Pitjantjatjara deserts - and sing to herself and laugh. The upshot: a suite of paintings that now fill the great private Aboriginal art collections of the world and change hands for hundreds of thousands of dollars apiece. The twist: none is in Australian state or national galleries, which regard work from private dealers as beyond the pale. Mrs Bennett, though, was happy with her fate in her last years: intensely happy, though the culture world she came from was in the past, and there were no longer nomad families in the far deserts, at the rockholes, singing. She had fulfilled herself, and shown outsiders all the splendours of her realm. She held court, and painted: she lived for years in seemingly strong health with failing kidneys. When the time came, she demanded to be taken to the Wanarn aged home in the Ngaanyatjarra lands, to be in her country. Her time there was very short. She knew. The night before she died she sang old songs from her birth country; she spoke to her classificatory sister by telephone, and they prayed together. In the morning, she, and a whole world with her, was gone. 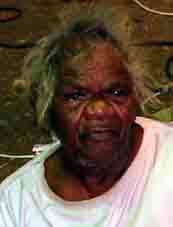 She is survived by her daughter, Dorcas Bennett; the funeral will be held in the western desert some weeks from now.